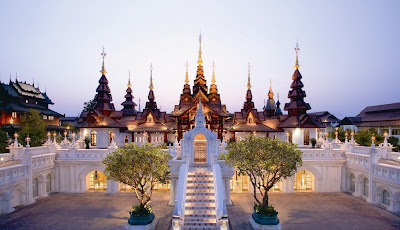 The majestic $80 million USD and 60 acres mandarin oriental property is a site not to be missed in Chiang Mai in fact it was referred to by many 'a living museum' of Northern Thailand and has turned into an icon. We stayed at the Grand Deluxe Villa with Plunge Pool, it was undoubtedly the best 5 star hotel we've ever stayed, it was like living in palace that time has forgotten. It's a totally different experience, we felt like we've died and gone to Heaven or we've been transported back to the 15th century Thailand where every single corner of the property is thoughtfully decorated with antiques and artifacts from the Lanna era not to mention their lush greenery which makes the resort ever so mystical and romantic. In short ART was EVERYWHERE the tiles, the carved wood, the statues and at a spare no expense rate. Please click the following link to know more about Lanna culture: http://en.wikipedia.org/wiki/Lanna. First of all we were at awe at the scale and architecture of this hotel this property is so huge that it has its own library which holds 5000 volumes, a spa,organic vegetable garden, temple, padi fields (with an ox and scarecrows),market place, cooking school and a thai village ! Oh did i mention this place is so huge you need horse drawn carriages (OMG) and golf carts to go from one place to the other or alternatively you can rent bicycles from the hotel. We couldn't find a flaw in this hotel, they had a very competent army of staff that greets you with your last name everywhere you go, impeccable service all the time, great food and even greater scenery and best of all you learn a new culture while you play. Dhara Dhevi ' means star goddess in Sanskrit' truly lives by the name that it is given, a resort that deserves to have a class of its own and we can't wait to go back. makan kings... seriously u guys r the best !! A real site on up-scale travel, hotel and food... also live like a king ! Respect !!! hhmmm.....probably put this on the 2010 itinerary. The Mandarin Orienal Hotel in Chiang Mai is a fantastic accommodation for lovers of luxury accommodation and great food in Thailand. Great insight man, much appreciated.